A small development of log cabins in a central location. Open throughout the year for holiday use, the Abbots is a charming development of just 14 log cabins. Their terraced location, in the centre of the park, overlooks a delightful lily pond home to several families of ducks. Dating back to 1986 it was a pilot project which proved highly successful. Each lodge is unique with a variety of exterior styles and finishes. Although development here is complete, from time to time the opportunity arises to purchase a previously owned lodge. With a woodland backdrop, the area is open plan with lawns and attractive planting, gardening is carried out by our small team of grounds staff enabling owners to sit back and relax. 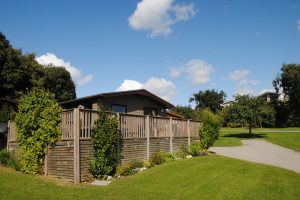 These holiday homes are connected to mains services and have the option of a landline connection for broadband and telephone. Each is different in style, layout and situation but all have their own driveway with parking for two cars and many have timber decking too. All information on our website is updated regularly but to avoid disappointment please telephone to check availability. We also operate a mailing list and would be pleased to hold your details with a view to contacting you as soon as any other properties become available. Our offices are open daily March – December and weekdays January and February. We are always pleased to welcome you to the Park and show you round but it helps if you could let us know you are coming. properties become available for sale.